STEM Outline: Students will create projects, read texts, watch science and technology videos in class and discuss the relevant concepts in class online. Students will also study the relevant mathematical concept. Students will then share videos of their home based science project on the school LMS and discussion board. English Outline: Students will develop their writing skills, vocab, reading and critical thinking skills along with learning the art of public speaking and creating presentation. Students will be expected to create a presentation and deliver to an online audience. Give your child the unique opportunity to meet with and interact with Muslim students from all over the world in their online classrooms. What a great summer experience! 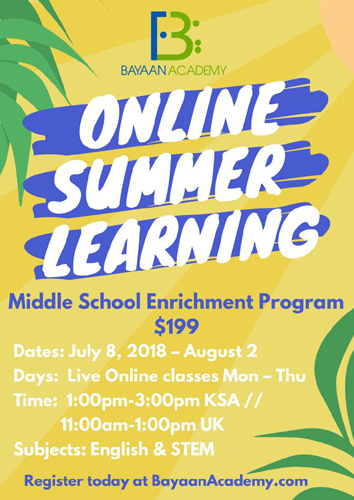 The summer program is $199 and is taught by Bayaan Academy’s qualified teachers with tons of experience teaching kids online. Summer teachers are Ustadh Yunus from UK, and Ustadha Hafsa from Madinah, KSA.